The fairy tale princess in all her apricot-tressed glory. Done in pencil on one sheet of 8.5×11 paper. I almost never draw full-page sketches; they’re usually only a few inches tall, a bunch crammed onto one page. Drawing all that hair detail was so fun! (I know; I’m insane) Sometimes it’s almost like Celtic knots. It got so complicated that I scanned it so I could fill in the color to see what was hair and what was not. Hello, my name is Meryl! First of all, I LOVE YOUR ARTWORK! 😀 I am a big fan already. 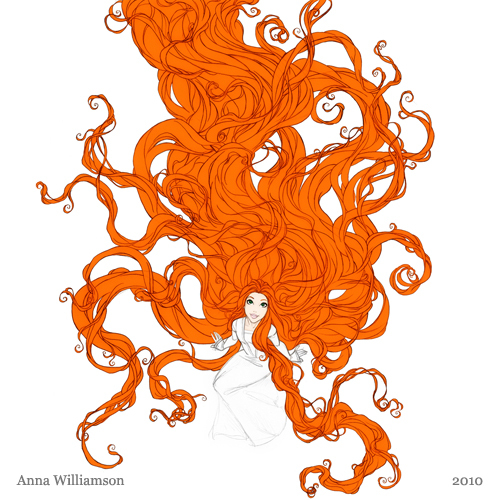 I was searching for Rapunzel drawings and I am so happy I found your website! 🙂 My friend loves Rapunzel and she wanted to a drawing of her…but I can’t draw. 😦 Sadly. Hey, almost anyone can learn to draw; when I was a kid, I just started by tracing other pictures until I had a hang of the shapes and lines. Rapunzel has always been a favorite of mine; I like long hair (obviously). You have SUCH a WONDERFUL way with hair! WOW wow WOW!!! And I adore the apricot color of this princess’s hair! YUM!! !